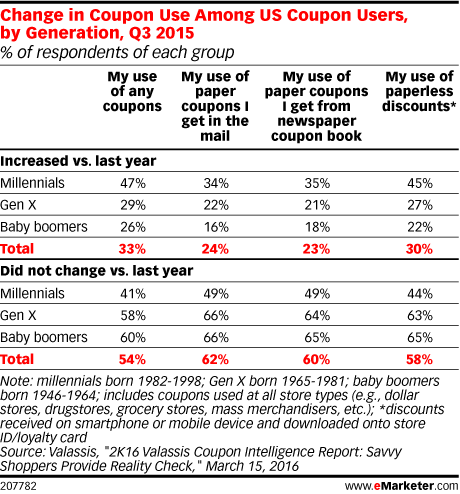 Data is from the March 2016 Valassis "2K16 Valassis Coupon Intelligence Report: Savvy Shoppers Provide Reality Check." 1,000 US internet users ages 18+ were surveyed online during Q3 2015 by Ipsos. Consumers were emailed an invitation to participate in the survey and were given 3 days to complete it. Responses were weighted by factors obtained from national census data to provide appropriate representations of demographic groups at summary levels. Valassis a direct mail media and marketing company.